Between 7:30 and 10:20 p.m. 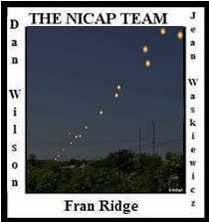 Many witnesses saw 1-5 large silver ­yellow objects flying erratically, stop and start. (Berliner) [The BB memo does say that F-94s were scrambled twice. The objects were observed visually from the tower and planes were directed visually but could not make any contact. It specifically says that radar picked up nothing unusual on any of the dates]. This is apparently case #5 of Major Dewey Fournet's "motions study" UFOs cases as presented to the Robertson Panel in January of 1953, whereby he deduced that UFOs were guided by intelligence and the flight characteristics indicated that the intelligence was beyond "us".